Bits of Blender has reached 1006 subscribers! We are also approaching 100,000 views for the series. My co-host Richard and I have not released an episode since February (#38), but we are ramping up for some new Bits for the new year. Blender is on the verge of a huge change from version 2.49b to 2.5. It is a major overhaul on the user-interface. As we learn more of the new Blender, we'll pass it along (as time allows). I'm also doing some reading on compositing in Blender. This aspect of Blender I've been light on, and many folks are not even aware of Blender's ability to do video editing and compositing. 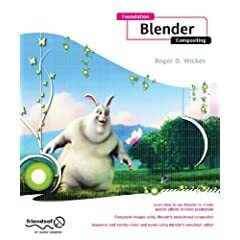 The best source I've found on the subject is Roger D. Wickes exhaustive Foundation Blender Compositing. It's got a nice layout, full-color, and Roger it very thorough in his coverage and also very honest in how he covers it (not to mention occasionally funny).